Lecturer in Russian historical studies and author Sam Gaddis is invited by a long term friend, journalist Charlotte Berg, to share a fantastic scoop that she is working on. She will break the story in the newspapers and then they will co-write the book together. Sam is being harangued by his ex-wife Natasha now living with a struggling restaurant owner in Barcelona into contributing more money for their daughter Min's schooling. So this scoop has come at the right time for Sam. He also has a romantic attachment with a Holly Levette who came to one of his book launches and approached him about boxes of correspondence left to her late mother by a lover who had worked for MI6. He is hoping that researching these records may help with the book they are planning. Suddenly Charlotte is dead from a suspected heart attack. 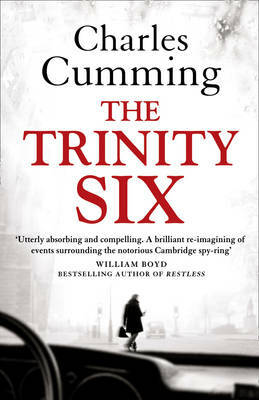 Sam decides to carry on Charlotte's work and establishes that a man called Thomas Neame, now in his nineties, has documents in his possession from a contemporary at Cambridge - Edward Crane - proving that he was the sixth man in the 1950s Cambridge spy scandal. This will have embarrassing consequences for both the British and Russian governments. Through Neame, Sam discovers that Crane was given a new identity in 1992 when his death was faked at a London hospital. Sam soon finds himself struggling with the information he is receiving from Neame and a nurse who was on duty when Crane's death was faked. Sam finds himself caught between two governments who, for their own ends, do not want Crane's story to be told. Moving between London, Winchester, Berlin, Moscow, Barcelona and Vienna this is an exciting thriller. This is the third book by the author that I have read and each is different. He seems to know the secret intelligence service well. You have to suspend credulity regarding certain aspects of this book but overall it keeps you in suspense and guessing. I thought at one stage that it was going to follow the trend of some modern books and hastily conclude abruptly, as with no denouement in sight I realised there were only a few pages left. However the conclusion was well worked with a neat little twist at the end for good measure. Very highly recommended.